Wendy Radford | Holistic therapies - Reiki healing and teaching - spiritual, emotional and complementary healing, workshops and courses. A phenomenal, life changing five-part online course. In choosing a therapist, interactive personal issues are important. I’m an upbeat and cheerful personality. With any of my energy healing techniques, you will receive a deeply relaxing and beneficial therapeutic experience, whilst being held in a safe and supported space. I help people reconnect to a joyful way of living. I will help you to stop self-sabotaging your happiness, goals, business, relationship – bringing your star quality to light, improving your self-worth and self-belief. I offer complementary therapies such as Avesa Energy Balancing with Egyptian healing rods, Key Therapy, and Reiki; together with emotional and spiritual investigation to encourage you to achieve some dynamic results, giving you the freedom to take control and feel more empowered in your life. If you wish to explore your spiritual and emotional issues in greater depth, why not consider ‘The Wendy Way’? A unique and tailored approach, combining the various forms of complementary healing methods that you and I feel are best suited and most beneficial to you personally. Pain, weight, addiction, relationships, judgements, love, family, work, fear, judgements, negative beliefs, shock and trauma. Cancer, Fibromyalgia and M.E. Remember, healing is a process, not an event. Be bold, be present, take charge. Living and working in the sleepy rural village of High Hurstwood, East Sussex, I am on hand to service most locations in this area. I work with people from all areas of life and all ages. If you’re unable to travel, you can arrange for a home or hospital visit. Passionate about the benefits of the power of vibrational, spiritual and touch healing, I also enjoy sailing, walking, music and salsa. 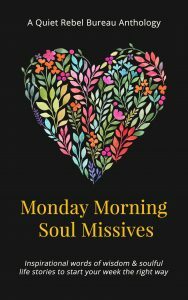 I’m a published author and I’m featured in the anthology Monday Morning Soul Missives. “I have been working with Wendy on my journey for over a year now and she is an amazing source of love and wisdom which will transform your life! She has helped me to understand many feelings from guilt, anger, and resentment to how to deal with that voice in your head that keeps you in fear of moving forward. She has literally changed the way I think about everything and has enabled me to make some radical changes to my life which has brought me peace and joy!